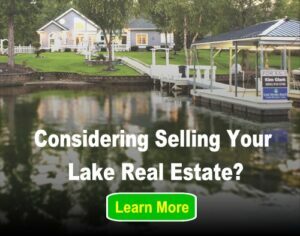 At LakeHomes.com, we aren’t shy about being crazy about lake real estate. We are Lake Homes Realty, after all, so the freshwater fanfare comes with the territory. But there seems to be an ongoing rivalry that mentions our bread and butter by name. Lakes or beaches? Grassy waterfronts or salty, sandy shores? When it comes down to the choice between lake living and beach bumming, it’s all about personal preference. To be fair, beaches have their perks. The sight, sound and smell of white-crested waves lapping on the shore at sunset; towering palm trees swaying in the wind; strong, unpredictable gusts of wind that whip sand into your food, hair and unfortunately, bathing suit. Yes, beaches are nice. But we’re here to give you a few reasons why lakes are simply superior. And yes, that pun is intended. Reason No. 1 to stay away from beachfront real estate: the sea eats everything. Saltwater and metal do not get along. As a matter of fact, they’re mortal enemies. Moisture, salt and oxygen are a lethal combination for metal objects like boat engines and can cause more kinds of damage than mere rust. Saltwater eats away at metals, weakening them and causing them to eventually fall apart at the seams. In fact, it consumes metal five times faster than freshwater. 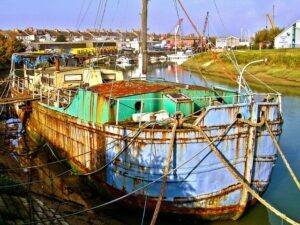 Add to that the humid, salty air of the sea, and you’ve got yourself a front row seat to corrosion at a rate 10 times faster than you’d find in freshwater environments. Aside from the corrosion of various metals by seawater, ocean bacteria are also notorious for consuming iron, turning it to rust. What can this mean for you? Maintenance, maintenance and more maintenance, which is another way of saying expense, expense, expense. Living on the beach involves an ongoing fight against the elements to keep your expensive possessions like boats, outdoor furniture, exterior lighting fixtures — even laptops and washing machines — from wasting away while you watch. And then there’s always land erosion. Having a beautiful beachfront home with a stunning view is nice until you realize the water gets closer and closer to your house each year because the sea eats everything, including the shoreline. That new boat you spent years saving for? Hurricane don’t care. We hope you are adequately insured because you’ll need it. Play it safe and buy a lake home. And we won’t even bring up climate change and how it is destroying the value of coastal property more and more every year. Changing sea level is not an issue on the lake. When it comes to the differences in lake and ocean environments, it really depends on the type of person you are. Beach volleyball or backyard barbecue? Nostalgic rope swings or adventurous deep-sea fishing? If you think you prefer sand and surf, here’s a head’s up. Public beaches have extensive restrictions — which can vary depending on which beach you go to — on what you can and cannot do on them. Do you like drinking beer or soda from glass bottles? Don’t go to the beach. Want to bring man’s best friend along for a day in the sun? Dogs usually aren’t allowed on the beach. Want to cookout, or grill, by the water? Not at the beach you don’t, because the beach police frown upon open fires. There are beaches don’t even allow kayaks, windsurfing or inflatable toys. In some places, kite flying is restricted. Swimming in certain areas is restricted. Jet skis? In many cases, restricted. Careful not to fall asleep to the sound of waves under the night sky, because even sleeping isn’t always allowed. Sunbathing, volleyball, building sand castles and other typical beach activities are fun, but admittedly don’t offer much by way of outdoor adventure. Unless, of course, surfing is your activity of choice. But for those of us who aren’t water-walking Olympians, there are lakes. For starters, you can quite literally do whatever you want. 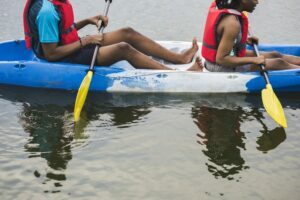 Some lakes are within state parks and have recreational restrictions, sure, but for most people the lake is in the backyard. Grill out and drink beer or soda from real glass bottles. Have a fun bonfire with friends or start a campfire for the night without worrying that an authority figure in a golf cart will arrive to rain on your parade. Instead of boating miles and miles out into the water to go fishing, cast a line from the comfort and privacy of your own dock. You can sunbathe, too, but there’s also kayaking, paddle boarding, hiking and canoeing. Lake homes are situated in a variety of different environments, which means there’s something for everyone. From the towering evergreens and mountains of Idaho to the waterfront vineyards of Vermont and Upstate New York, we’ve got you covered. Lakes also tend to stay relevant year-round. Beaches turn into ghost towns as soon as the temperature drops, but it’s easy to find a lake that is a hot spot in all four seasons. In some areas, like Lake Michigan and Lake George in New York, you can enjoy cross-country skiing, snowshoeing, ice-fishing and sledding in the winter. Have you ever tried cross-country skiing at the beach? It is very unpleasant. Wildlife and scenery in lake environments are extremely diverse, which spells good news for everyone from hunters and biologists to painters and photographers. You just can’t take in the beauty of colorful fall foliage on the shores of the Pacific. Precious little animals like ducks, swans, bunny rabbits and deer are spread across the landscape, whereas the sea has everything from volatile seagulls that steal your sunglasses to deep-sea fish with no eyes and razor-sharp teeth who routinely consume prey 10 times their size. But go enjoy the beach if that’s your thing! We promise not to hold it against you. It’s just that we felt the need to weigh in on this debate since we are the lake experts. The beach has its perks, sure, but the benefits of lake living far outnumber them. So at the end of the day, you should just play it safe and buy a lake home.